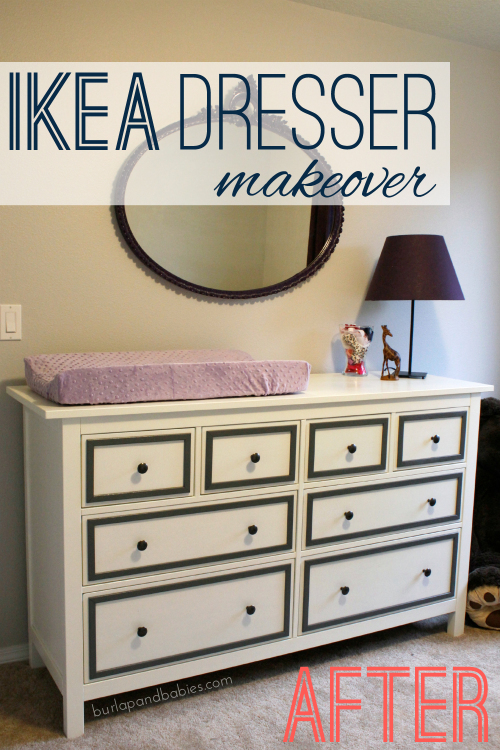 This Hemnes IKEA dresser makeover has been made over to better fit a little girl’s nursery. See the full IKEA hack here! Months ago as we started searching for items for baby girl’s room, I started stressing that we were never going to find the perfect dresser for the perfect price. Well, little did I know that just two days later I would find the perfect dresser for the perfect price at Goodwill nonetheless. 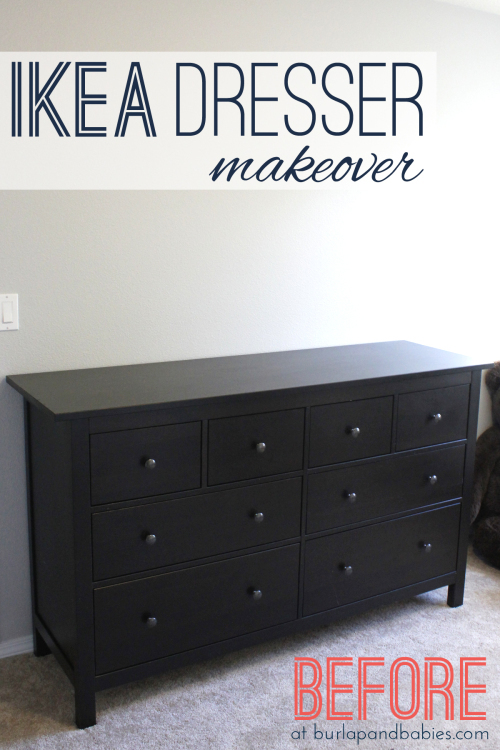 So began my IKEA dresser makeover! At the end of July, soon after we found out baby g was a girl, we started dreaming up the nursery and figuring out what we wanted it to look like. One Saturday night we decided to make the 45 minute drive to IKEA to start looking at our options. 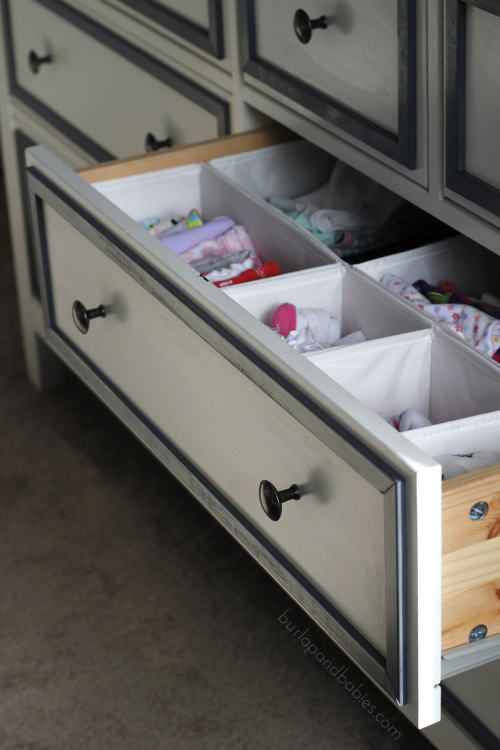 We found the perfect dresser for the nursery in the Hemnes 8-drawer white dresser. The price, not so perfect. So we decided we’d keep looking. Two days later, I woke up early on Monday morning and decided I would just start searching Goodwill for something similar to my dream dresser that would easily function as a changing table too. I quickly headed to my local Goodwill Outlet to be there by the time they opened at 8am and as soon as those doors opened I bee lined it to the furniture section. As I walked up I could have cried!! Sitting there all pretty and ready to go home with me was the exact IKEA dresser in black for $200 less than IKEA was selling it for. I could find nothing wrong with it except the back leg needed a piece of wood secured a little better which could easily be fixed with a little gorilla glue. We knew we wanted the nursery to be light and fresh so the black wasn’t going to cut it but that didn’t scare me. I started by doing a little pinterest research into painting IKEA furniture and decided on doing a few coats of KILZ Latex Primer, white paint, and then a few coats of Minwax satin polycrylic protective finish. After one coat of Kilz, this is what it looked like. Don’t get worried!! You’ll see that I used a small roller rather than a brush. 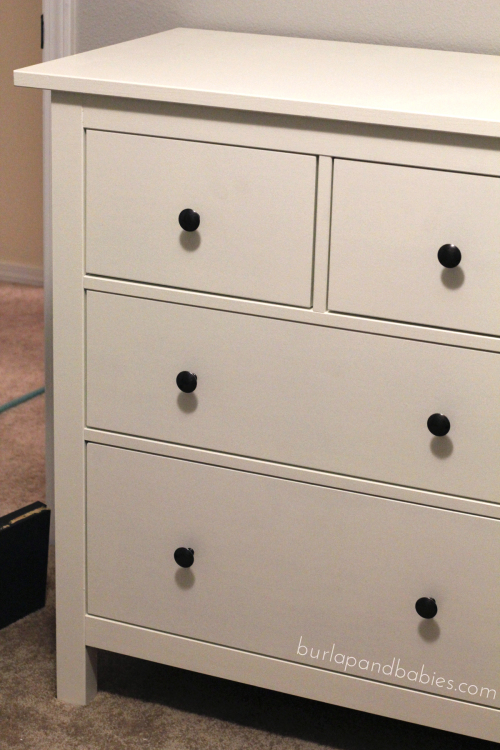 If you look at the IKEA dresser, there are no paint brush marks so the roller is really the route to go. Granted, I did use a brush in the corners and edges to make sure there was no black showing through once I got all done. But then just keep going! After 3 coats of Kilz and two coats of white paint, this was our final product. Looking good! We successfully went from a black dresser to white. But ya know, I just felt like it was missing something. This little girl needed some more pizazz. So off to Home Depot we went and bought some 3/4 inch wood moulding. Thankfully, my handy husband is super talented with tools so I left all that business up to him. But it honestly was super easy. Just measure each drawer, take an inch and a half off each width and height, and cut all the trim at 45 degree angles. From there, I was on paint duty. We originally painted the moulding all purple to match the nursery but then decided if we wanted this dresser to last through multiple children, and knowing that there’s a high likelihood of having at least one little boy, purple probably wasn’t the best option. We spent many nights spray painting away, first to purple, then to gray. Once they were all painted and no purple was showing through we went to work attaching the trim to the drawer fronts. 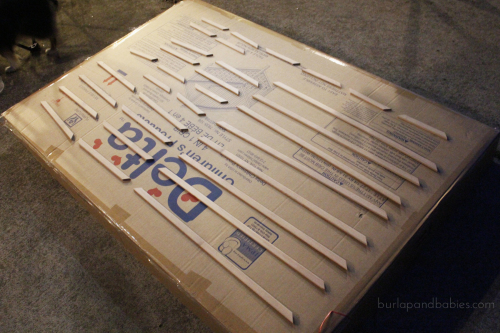 We planned on making a jig so that they were all nailed into the same place, however, it was way easier to just eyeball it and use a micro-pinner (which by the way, is my new favorite tool!!!) to attach them to the fronts. One tiny nail in each corner and we were done!! You’ll see the pieces didn’t all align perfectly, but heck, we aren’t pros. And besides, baby girl isn’t going to care much. If you have this problem though and are OCD about it, fill with wood filler and then paint over it. 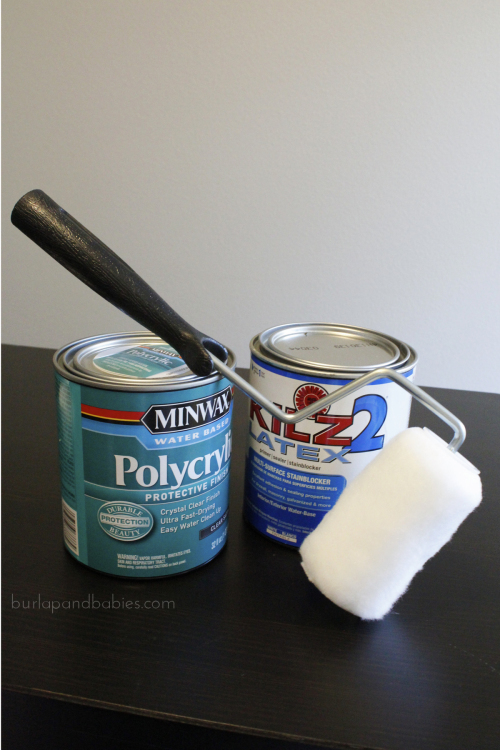 If you used spray paint to paint your trim (like we did), you’ll need to spray into a container and then use a brush to paint the trim. A little more difficult and after already painting the dresser for what felt like week after week, we decided it wasn’t worth it. Once all the trim was on, a few coats of polycrylic to seal the deal and leave a glossy finish and then BAM!! 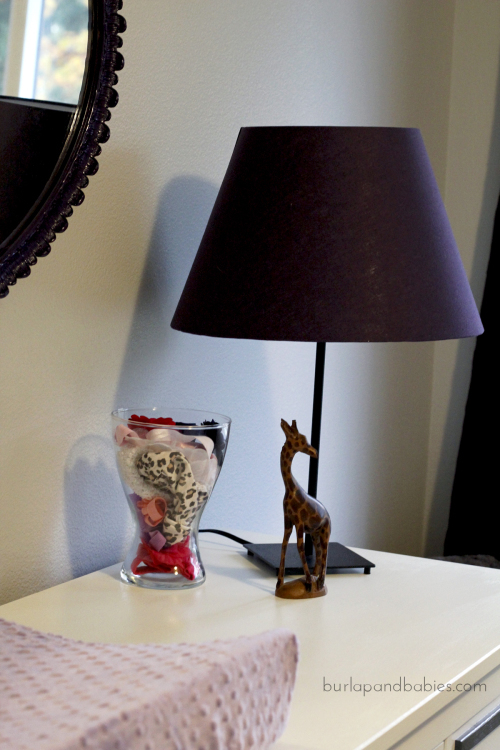 A classy, sophisticated dresser to fit our new little girl’s room perfectly. You’ll see, I bought some IKEA drawer organizers to help keep little one’s clothes and toys organized. In case you missed my mirror makeover last week, be sure to check it out to see how I made a $20 vintage 1940s Craigslist mirror match this little girl’s purple room. I’m still waiting for my mobile pieces to arrive from Etsy that I ordered over 6 weeks ago…but as soon as that arrives in the mail I promise to show you the full nursery! Maybe, hopefully, some of the pictures might include a little one sleeping in her crib. Who knows?! Due date is T-minus 2 days!! Stay tuned for baby updates on Instagram and Facebook! 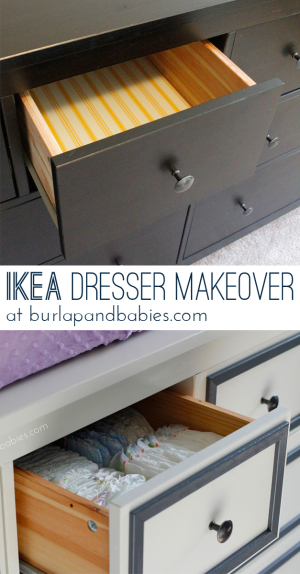 What do you think of our Ikea dresser makeover? Have you made over any furniture recently? I had so much fun with this project and would love to see what you’ve been up to? Share in the comments below! If you liked this post, be sure to pin it to Pinterest or share it on Facebook using the share buttons below! Affiliate links may be used in this post. Ordering a product through this link may result in a commission, which helps pay for the cost of running this site and keeps the content free. Read my full disclosure policy here. Wow, it is amazing how much the wooden detail you added makes such a difference on the overall piece. I just LOVE it. And, those drawer dividers are pretty awesome, too! Thanks, Carrie! I agree. The trim makes such a difference!! And the drawer dividers are perfect! Definitely helped a ton to get all the little clothes and toys organized. Thanks! I love it too. The trim totally made it! :) Hope you and Caleb are doing well!! I LOVE this, Amanda!! It turned out SO great! I’m in love with that little wood trim around each drawer, it’s just the perfect touch! YAY Goodwill! So, I’m not sure how I missed this before, but this is stunning! I love the white, but I really love how you framed all the drawers!! Seriously pinning this now! How has the dresser held up as far as scratches? Always nervous to paint things like this because it looks great when it’s done but when you actually use it I feel like painted furniture scratches easily… what was your experience? Yes agreed. It can be nerve wracking. Honestly, our dresser has held up amazingly!! I use it as our changing table and I swear, no matter how hard I try, the top is covered with stuff about 90% of the time. Plus, my little one is constantly opening and closing the drawers. The poly really helps to keep it looking great without knicks and scratches. Did you do any sanding? I have the same piece and want to make it white for my nursery. Hi Kristina. No, I didn’t do any sanding. Just a good cleaning beforehand and make sure and buy quality paint.